I must admit that city-building simulators have a way of capturing my imagination. Perhaps it's the bestowing of god-like powers to create, shape and tailor a civilisation to my liking that I enjoy best. Or maybe it's the reinforcement that comes with experiencing the cause-and-effect results of micromanaging your environment. Unfortunately (or fortunately) A Kingdom For Keflings doesn't quite give you either. 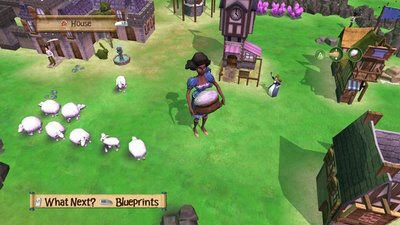 Taken for what it is, A Kingdom for Keflings is a minimalistic, addictive, and stress-free Xbox Live Arcade title. In this sim game you won't encounter any conflict, no one in your city will complain, and nothing catastrophic will ever happen. The premise is simple: you are thrust into the role of a sizable giant, entrusted with the role of directing your peons, or Keflings, to build you a beautiful, sprawling kingdom. One interesting feature of the game is that it's the very first title designed from the ground up use the New Xbox Experience's avatars. Surprisingly it's actually quite fun to prance around your kingdom as a giant version of your custom-designed NXE avatar. 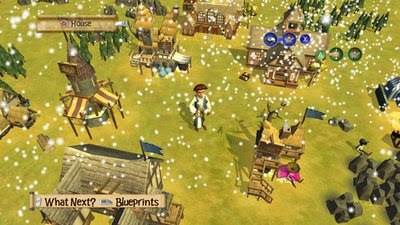 You start off with nothing but a town square, a resource-rich environment and a handful of Keflings. 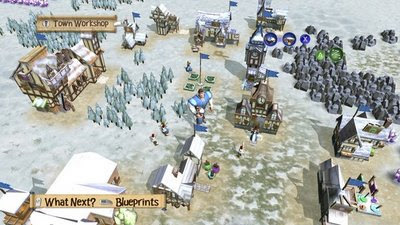 The game features four resource types - rocks, wood, wool and crystals - that must be harvested to build and expand your kingdom. Keflings are incapable of independent thought and so you must direct their every move. They also suffer from single-mindedness and are only able to perform one task at a time. If you want a Kefling to chop wood, you need to pick it up and place it on a row of trees. Then, you need to pick it up a second time and direct it to where you want the resources deposited, typically your workshops and factories. Once you have collected a supply of resources, your next task is to select a blueprint from your tech tree then go into your workshop and build the pieces one-by-one. Your pieces will queue up and will appear one after another outside your workshop on the main map. Your giant can place the first block anywhere they choose, and the blueprint menu in the top-left corner will show you where subsequent blocks are to be placed. After you have successfully fulfilled the blueprint requirements your building will erect itself while you happily watch from afar. This will generally unlock more buildings in your tech tree, allowing your kingdom to evolve and acquire new technologies. The game is very straight-forward, almost too much at times. You see, while it's fun to build structures, there really isn't much else to do. There is no micromanaging such as shaping your land, changing taxes or funding, or creating roadways. The game centres almost completely around collecting resources to build blocks and then picking them up and setting them down. Should you need resources, your giant can go out and harvest themselves, but they can only collect one resource at a time so it can be mind-numbingly slow at times. Expect to just sit around and watch your Keflings gather resources far too often. There is the odd sprinkling of other tasks to complete, such as accepting mayor or king quests. Generally these involve menial tasks such as "bring 50 cloth to the Contractor's Office" or "Paint three houses" and never really add any excitement or sense of accomplishment. The rewards are generally good, such as giving you hearts to grow your Kefling population or new tools to mine resources faster. 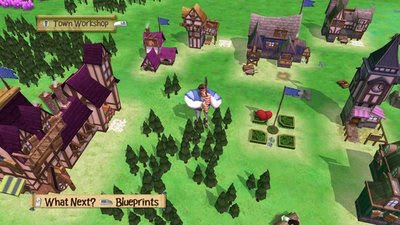 In addition, there are a number of hearts and tools hidden in resources around your kingdom, giving you incentive to harvest all available resources. The graphics are adequate and complement the relaxed feeling nicely. The game is bright, colourful and cheery. There are a few weather effects such as rustling leaves during fall and blizzards during winter. Sadly though, these effects are marred with slowdown issues and occasionally brings the gameplay to a halt. Perhaps the biggest drag to this otherwise happy-go-lucky sim game is the freezing that frequently occurs. During my roughly ten hours of game time I had two major lock-ups, resulting in hard resets. Combined with the fact that there is no auto-save features means one freeze-up can result in plenty of wasted time. The lesson here is save early, save often. The game also is dragged down by some unnecessary gameplay complications. For example, if at any point in the game you need to relocate a building for efficiency's sake (e.g. if you need to move a stone mill closer to your rock pile), you rather monotonously need to hack your building into it's component parts and then carry them one by one to their new location. Since the map is quite small you'll find that it clutters really fast and often times it's not worth the effort to transport your buildings across town. Further complicating the mechanics is that each workshop has it's own stockpile of resources, meaning there is no central repository of resources. 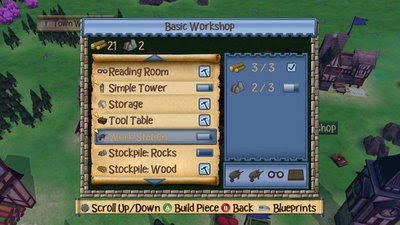 When you reach the later stages of the tree tech, some buildings require block from multiple workshops thus requiring you keep all workshops resourced. Often you'll find yourself arduously spending time moving wood stockpiles from one workshop to another. Overall though, I do think that as a pick-up-and-play game, A Kingdom For Keflings fills the role nicely. The low pressure feel to the game is kind of refreshing given the gamut of high stress, high intensity games on the Xbox 360. The game also features a four-player drop in/drop out multiplayer mode as well, further extending the life of the game. The music is okay, but from what I can tell there is only one track in the game that loops endlessly. Thankfully, it's rather pleasant. 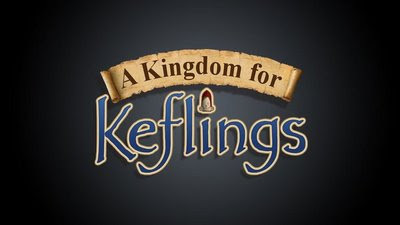 If you enjoy carefree sim games and want a charming, ten hour experience then I recommend A Kingdom For Keflings. At 800 Microsoft Points (roughly $12.50 Canadian) the game has enough value to justify admission. Nice review. There's got to be an audience for this type for game and it certainly isn't me. I'm all for console-friendly, accessible RTSs but there's nothing at stake when you play Keflings. I tried the demo and could only get through building a few structures before growing bored. Feels like a lot of busywork without any good payoff!